The Art of Chocolate. From the Finest Cocoa to Exquisite Chocolate. part 9 | WHY DO WE LOVE CHOCOLATE? Solid chocolate that does not contain additives is perishable; it should not be left for too long before it is consumed as it will not improve over time. It should always be stored under dry conditions and at a constant temperature of between 12°C and 20°C; cold, heat and light are equally harmful. Under these conditions, it should keep for a relatively long amount of time: dark chocolate for up to two years, milk and white chocolate for up to one year. Dark chocolate has a longer shelf life than white chocolate, since the latter contains milk components wheraes dark chocolate contains oxidation-inhibiting substances, such as polyphenoles, for stability. Some additives reduce both suitability for storage and shelf life. These additives include milk and cream powder or nuts, which become rancid over time. If stored in the fride, chocolate should be kept in a sealed, airtight plastic container to protect it from moisture and unwanted odours (such as cheese, pesto, cooked food), wich it would otherwise absorb. Before it is eaten, it should be brought to room temperature, as low tempearture prevent the aroma from unfolding fully. If chocolate is subjected to a large change in temperature from a very cold to a very warm environment, moisture can release the sugar from the chocolate and, when the water has evaporated, the sugar remains on the surface in the form of crystals; this is known as “sugar bloom”. A typical chocolate bar is a mixture of cocoa butter, cocoa solids, sugar, and an emulsifier such as lecithin. The cocoa butter and cocoa solids are made up of hydrophobic molecules (from the Greek for “water fearing”) while sugar is generally hydrophilic (also Greek, meaning “water loving”). 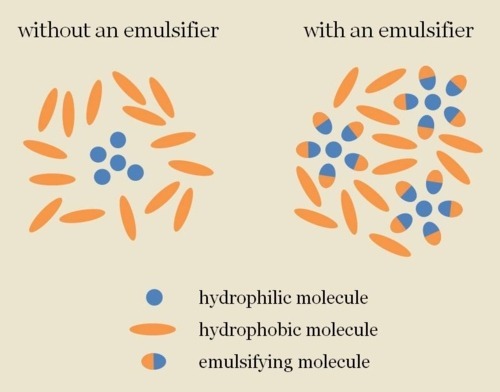 Hydrophilic and hydrophobic molecules don’t mix well, so an emulsifier is used to help blend the different molecules and keep them from separating over time. If chocolate is stored at too high temperature, if it is exposed to the sun or subjected to the sun’s rays hotter than 32 to 33°C, fat crystals froms and are deposited on the surface in the form of a white layer: this is known as “fat bloom” and is often mistaken for mould. Similarly, fat bloom occurs when hydrophobic cocoa butter molecules separate from the rest of the chocolate and make their way to the chocolate’s surface. The specific causes of fat bloom are a bit more complicated and have been the focus of several scientific studies. Who knew so much research went into something as simple as a chocolate bar? 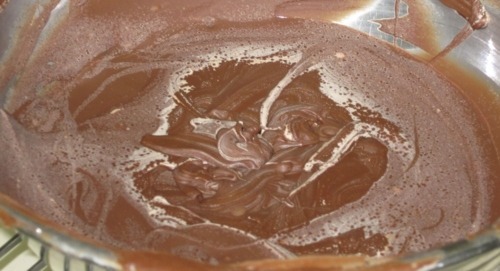 Another danger is oxidation, which occurs if the chocolate is exposed too often to light and air. The fats react with oxygen and become rancid; the aromas vaporise. The higher the cocoa content, the better the chocolate is protected against oxidation. Chocolate is best stored in an airtight container in a dark place. This basic idea of mixing hydrophilic and hydrophobic molecules also explains the driving forces behind chocolate bloom. Sugar bloom occurs when chocolate comes in contact with water. Because sugar mixes with water more readily than the fats in chocolate, any moisture that comes in contact with chocolate dissolves the sugar at the chocolate’s surface. As the water evaporates, a grainy white mess of sugar crystals is left behind. An unforgettable drink Although the Spanish were the first Europeans to taste chocolate, by that time, the Mayas and Aztecs has been enjoying the cocoa for a very long time. In liquid form, hot or cold, chocolate has probably been consumed for a good 3.000 years. However, solid chocolate, as we know it today, has been eaten for less than 150 years. The native Mexicans ground the beans into a paste, added spices and pressed it into cakes. To make it into a drink, they scraped the required amound from the hard cake, poured it into a vessel and added water. This chocolate is nothing like the chocolate we drink today. The native Mexican nobility refined the chocolate by adding ingredients such a vanilla, wild honey, agave juice and chilli powder. The conquistadors then adopted the basic recipe, including the vanilla, a New World plant but, because the flavour of the “xocolatl” of pre-colonial Mexico was too bitter, transformed it to their taste by adding lots of sugar, aniseed, cinnamon, almonds and hazelnuts. The resulting drink was praised for its energising and restorative effects. For many years, chocolate was expensive and exclusive and was enjoyed only by the European nobility. The Spanish monopoly only crumbled when competition emerged from countries such as Portugal and England, and this brought prices tumbling down. Although the raw product became cheaper, chocolate was still not consumed by common man, such as farmers and craftsmen, but it remained the exclusive preserve of the upper middle classes. Chocolate houses opened serving the most expensive of tree new drinks, namely chocolate, coffee and tea. People enjoyed these beverages in vast quantities whilst discussing the topical issues os the day. The chocolate consumed today consists mainly of cocoa powder and sugar or instant powder; this can be stired into a hot or, in case of instant products, also into a cold liquid. Although, today, real hor chocolate is very much rarity, chocolatiers and specialist shops and outlets that value authentic, honest and first-class products are increasingly re-introducing it. After all, it’s basically quite simple to make: take a few peices of chocolate (preferably different varieties of Grand Cru with varying cocoa contents up to 100 percent), dissolve them in hot, fullfat milk, stirring continuously, and there you have it: a delicious, slightly foamed hot chocolate drink. Next time: A mellow sensation, marvellous aromas. Just finished watching the movie Chocolat, and hated how protagonist is depicted as evil just because she opens a chocolate shop and manages to get the narrow minded people to patronise her shop and of course, fall in love with chocolate. Why is chocolate depicted as something that is immoral? I live in London. Do you know of any good chocolate shops that sells that real thing? Paddington, but she follows them only for Christmas & New Year, so sorry!